The partnership between FRAMECAD and Intellisteel is poised to disrupt the construction industry in the U.S. for years to come. Together, these two innovative companies make construction faster, more efficient and more cost-effective. The FRAMECAD System is a modern method of construction offering a faster way to design and build strong, durable Cold Formed Steel (CFS) frame buildings easily and efficiently, anywhere in the world. Intellisteel has taken this solution to another level, introducing a fully mobile, on-site steel frame factory that incorporates the FRAMECAD System into its advanced manufacturing process. This process eliminates the risk and cost of freight, improves scheduling and increases reliability on-site. It also creates computerized precision-formed metal studs and tracks to a millimetre tolerance, reducing the need for skilled labour. It’s impossible for traditional framing to match the speed of this production method for walls, trusses and joists, or for an entire superstructure. 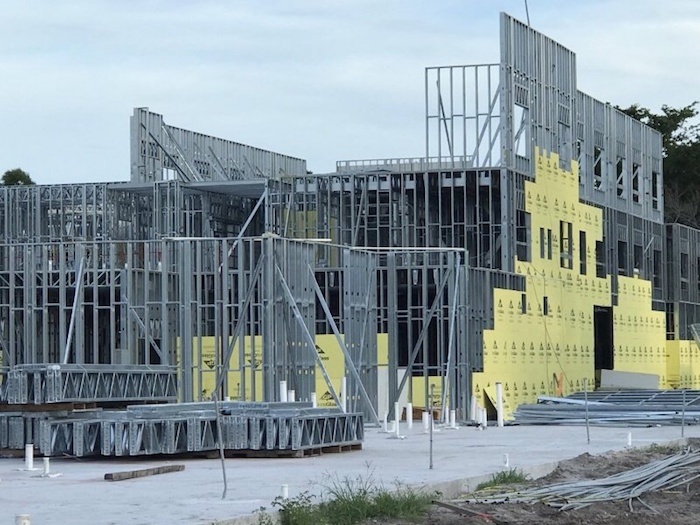 Read more on the Intellisteel and FRAMECAD partnership which enabled the fast design and delivery of 320 manufactured and assembled CFS panels for a three story low-rise building in Florida. This 131,000-square-foot building project was completed in approximately 12 weeks – nearly a month faster than had been scheduled. Discover our case study, here.